The Biscay Marine Energy Platform (BiMEP) is an open-sea facility to support research, technical testing and commercial demonstration of pre-commercial prototype utility-scale floating Marine Renewable Energy Devices or MREDs BiMEP provides manufacturers of such devices with ready-to-use facilities to validate their designs and to test their technical and economic feasibility. BiMEP occupies a 5.3 km2 marked area excluded for navigation and maritime traffic, and located at a minimum distance of 1,700 m from shore, close enough for fast access to deployed devices. The water depth in this area ranges from 50 to 90 m. The total power of 20 MW is distributed over four offshore connection points of 5 MW each. 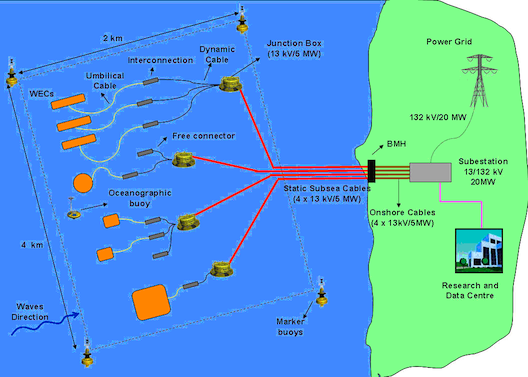 Each berth is connected to the onshore substation via a dedicated three-phase submarine cable in series with a land three-phase line, both at 13.2 kV. The onshore electricity substation houses electrical protection systems, measurement systems and transformer, allowing the berths to be connected up to the national power grid. The berths are fitted with commercial power and fibre optic connectors to enable swift connection and disconnection of MREDs. In 2011, the Promoter (EVE) proceeded to tackle the final step and obtain the concession of marine-terrestrial public domain which was granted on the 6th of February 2012. Authorisation has been granted for the installation of facilities and contracts awarded for the supply and installation of submarine power lines and ground cables, which will transfer power from the offshore sites to land. In November 2012 the first horizontal drilling work started with the installation of the submarine power cables. On the 20th September 2013 the work for the installation of submarine cables started. In parallel to these operations the construction of the electrical substation and the purpose built office took place and on July 2015 the test centre was inaugurated and ready to operate. According to the Basque Country’s Energy Strategy, wave energy, together with floating offshore wind,is one form of marine energy for which a significant production is expected in the midterm. The technological development and the particular geographical characteristics of the Basque Country provide suitable preconditions for the production of such energy. Furthermore, the presence and current level of development of the naval industry in the Basque Country are determinants for the wave energy sector to be considered as a strategic and promising sector in the Basque Country. In this context, the Basque Energy Board (Ente Vasco de la Energía-EVE) launched in 2008 the initiative to build the BIMEP (Biscay Marine Energy Project). The BIMEP platform is to be established encompassing part of the inner waters of the Basque Country’s continental shelf and the Spanish territorial waters, two miles offshore the shoreline of Armintza (Bizkaia, Basque Country), which is under the jurisdiction of the municipality of Lemoiz (Bizkaia). The establishment of this platform entails the installation of wave energy converters. The installation of such devices required the closure of a sea area of 5 km2 to activities like artisanal fishing, navigation, aquaculture and recreational activities. apply for the concession of marine-terrestrial public domain, which is a two-step process and involves the Spanish Ministry of Public Works and that for Environment, Rural and Marine Affairs. Submission of an additional Environmental analysis document undertaken by AZTI-Tecnalia. This document should cover the following aspects: a) actions that may cause environmental impacts throughout the different stages of the project (i.e. planning, construction, operation and abandonment), b) potential environmental impacts of the project, c) mitigation and corrective measures/strategies to offset the potential negative environmental impacts, and d) an Environmental Monitoring Plan of the project. Consultation with stakeholders, which is to be carried out by General Directorate for Environmental Quality and Evaluation (Spanish Ministry for Environment, Rural and Marine Affairs). In this case, the consultation process included key stakeholders, such as fishermen guilds (cofradias) and environmental NGOs, amongst others. Spanish cofradias (fishing guilds) are institutions with and old tradition that in some cases dates back many centuries. Their aim is to assure collective economic exploitation of fishing resources in coastal area. The cofradias are the institutional system for more than 80% of the employment in fisheries in Spain. In addition, more than 50% of landings are under the control of cofradias. It is a clear distinction between cofradias and other organizations such as boat owners associations or producer organizations. The cofradias are related exclusively to coastal fisheries while the other organizations deal with industrial fisheries. The cofradias are organized democratically and both the crew and the boat owner have representatives in the executive bodies. These institutions are well recognized by the Spanish and regional law and can propose management rules in their area of influence such as fishing time, allowed fishing gear and area and time closures. The rights of cofradias can be considered a form of territorial use rights in fisheries (TURFs). Consequently, in July 2008 a preliminary Environmental Impact Study (EIS) of the BiMEP project was undertaken by AZTI-Tecnalia. In November 2008, the General Directory of Energy Policy and Mines of the Spanish Ministry of Industry, Tourism and Trade (which is the competent authority to concede the technical permission for the BiMEP project) sent all the documents of the project to the General Directory of Quality and Environmental Evaluation of the Spanish Ministry of Environment, Rural and Marine Affairs (which is the competent authority to concede the environmental permission of the BiMEP project). In April 2009, the General Directory of Quality and Environmental Evaluation of the Spanish Ministry of Environment, Rural and Marine Affairs request for some additional information about the project and their impacts. In order to respond to this request, in April 2009 a complete Environmental Impact Study (EIS) (undertaken in December 2008 by AZTI-Tecnalia) was sent to the above mentioned General Directory and in parallel a personal meeting was held with their representatives. Based on a detailed analysis of these three documents/steps, the Spanish Ministry for Environment, Rural and Marine Affairs adopted in June 2009 the decision for the BIMEP not to be subject to the full Environmental Impact Assessment process. The analysis of the Environmental document had concluded that no significant environmental impacts would be found as a result of the implementation of the BiMEP project. Furthermore, most stakeholders consulted about the potential affection of the BiMEP did not envisage significant impacts on habitats, protected species or environment as a result of the implementation of the BiMEP. In any case, taking in to account the uncertainties of the impacts due to the early development stage of wave energy harnessing devices and the lack of referenced data accounting for environmental surveillance of specific projects, the Environmental Statement recommended the implementation of the environmental monitoring program suggested in the Environmental Impact Study of BiMEP project. This environmental monitoring program started in August 2011 in their preoperational phase and was undertaken by AZTI-Tecnalia. Taking into account the aforementioned decision and continuing with the administrative process, in 2009, the Promoter (EVE) requested the administrative authorization for the BiMEP installation and its public use declaration. For the purpose of obtaining the administrative authorization and public use declaration of the installation of the BiMEP infrastructure, the Promoter (EVE) submitted to Spanish Ministry of Industry, Tourism and Trade and the Provincial Industry and Energy Dependency of the Spanish Government Delegation in Bizkaia several documents, which included, a) the preliminary draft of the project, b) an environmental analysis document, and c) an economic evaluation analysis document. In accordance with the provisions of Articles 125 and 144 of Royal Decree 1955/2000 and Article 27 of Royal Decree 1028/2007, the preliminary draft was submitted for public consultation and reprints were sent to key administrations and stakeholders. The City Council of Lemoiz, the General Directorate for Planning, the General Directorate of Ports and Maritime Affairs, and the General Directorate for Fisheries and Agriculture of the Basque Government, as well as the Basque Water Agency did not provide any feedback. On the other hand, the Department of Public Works of the Provincial Council of Bizkaia, the Bilbao Bizkaia Water Consortium, the General Directorate for Fisheries and Aquaculture of the Spanish Ministry for Environment, Rural and Marine Affairs and Iberdrola (Spanish energy company) did not present any opposition to the project and, where appropriate, they indicated technical aspects to be considered in drafting the execution project of the BiMEP. Based on several documents and outcomes of the consultation process, the Spanish Ministry for Industry, Tourism and Trade (of the General Directorate for Energy Policy and Mining) authorized, in 2011, the installation of the BiMEP, and stated in particular the declaration for its public use. Also In 2011, the Promoter (EVE) proceeded to tackle the final step and obtain the concession of marine-terrestrial public domain which was granted on the 6th of February 2012. Once authorisation for project execution was granted for the installation of facilities in 2012 and contracts awarded for the supply and installation of submarine power lines and ground cables, which will transfer power from the offshore sites to land, in November 2012 the first works started with the horizontal drilling for the installation of the submarine power cables. This horizontal drilling allows the landing of the submarine cable from 15 m depth to the shoreline. Finally on the 20th September 2013 the works for the installation of submarine cables started together with the environmental monitoring plan of this phase of the BiMEP project. Finally, the work for the installation of submarine cables started on September 11th 2011 with the pre-lay grapnel run of the cables route. Between the 20th and 27th of September 2013 the lay of the four submarine cables was done. In parallel to these operations, the environmental monitoring plan of this construction phase was done by AZTI-Tecnalia and the construction of the electrical substation and the purpose built office took place. BiMEP was officially inaugurated in July 2015. Today BiMEP hosts the first floating wave energy device connected to the grid in Spain, the MARMOK-A-5 device developed by the Basque company Oceantec Energías Marinas. This company, promoted by TECNALIA and Iberdrola, has recently deployed its first Wave Energy Converter (WEC) at BiMEP. The transport to site operation of the WEC, so-called MARMOK-A-5, and its installation at BiMEP was completed on 12 October 2016. Oceantec has been working on the development of its own wave energy conversion technology over the last 4 years. It is a point absorber based on the Oscillating Water Column (OWC) principle. The prototype installed at BiMEP resembles a large floating buoy of 5 metres in diameter, 42 metres in length and 80 tonnes weight. The generating system comprises two air turbines located in the upper part of the device with a rated capacity of 30 kW. The turbines were previously tested at Mutriku wave power plant. The device was connected to the grid in early December delivering the first kWh on 13 December. The technology development has been supported by the Basque Energy Agency – Ente Vasco de la Energía (EVE) under a Pre-commercial Procurement Contract. The testing activities of the WEC are also part of the European project OPERA. Tecnalia is about to install the HarshLab an offshore laboratory that enables testing of new materials and solutions against corrosion, ageing and fouling in the marine environment, in real conditions that are monitored on site. Recent developments in the offshore wind energy sector have promoted the interest of accreditation of BiMEP facilities for the testing and demonstration of offshore wind developments as well. Taking into account that these new developments could produce new and different environmental impacts in comparison with those described in the Environmental Impact Study (EIS) of the BiMEP project undertaken by AZTI in 2008 in relation to wave energy harnessing devices, the development of a new EIS was needed. This was especially important taking into account that BiMEP project is inside an Especial Protection Area for birds declared under the Birds Directive (Directive 2009/147/EC), the ES0000490 Mundaka-Cabo de Ogoño Special Bird Protection Area. This new EIS was developed by AZTI in 2016. During the public consultation process of this EIS in the framework of the EIA process in Spain, some amendments and comments to the EIS developed in 2016 were done by different stakeholders. Thus, in 2018 a new EIS was developed by AZTI in order to correct, respond and improve those aspects and amendments indicated during this public process. This new EIS was presented in February 2018. On the 31th of May 2018, on the light of the new EIS of the BIMEP offshore wind project developed by AZTI the Ministry of Agriculture, Fisheries and Food and Environment of the Spanish Government decided to give the environmental approval to the offshore wind development projects on the BIMEP test site. The main environmental factors that the EIS considered that could be affected by the project actions are hydrodynamics, landscape, benthic communities, ichthyofauna, marine mammals, fishing activity and archaeological and cultural resources. The main actions of the project which could affect the above mentioned environmental factors are related with the installation and presence of structures (submarine cables, moorings and WECs) which can lead to generate a competence with other users, noises, electromagnetic fields, reduction of marine energy, etc. The new EIS developed by AZTI in 2016 and 2018 considered that the main environmental factor that could be affected by the testing of offshore wind devices in BiMEP could be the marine birds communities protected under the ES0000490 Mundaka-Cabo de Ogoño Special Bird Protection Area. Consequently, an ambitious environmental monitoring plan over marine birds was suggested to be undertaken during the pre-operational, construction, operational and decommissioning phases. Biscay Marine Energy Platform (BiMEP) is located in Spain. This monitoring phase correspond to the environmental characterization of BIMEP area previous to any installation work, thus complementing the information gathered in the Environmental Impact Study. Wave measurements and numerical modelling to predict the potential impacts of WEC devices on the wave regime. Data coming from a measurement platform installed in bimep (Wavescan buoy of Fugro Oceanor) in March 2009, current meters and other buoys were employed. Shoreline wave attenuations of 0-15% might be expected and limited local beach elevation changes were predicted to be limited to less than 0.2m. No significant contamination identified. Some sediment is expected to be suspended into the water column during construction, but localized and of short duration. Water quality data analysis coming from the Littoral Water. Quality Monitoring and Control Network of the Basque Country that AZTI-Tecnalia undertake since 1995 for the Department of Land Action and Environment of the Basque Government. No significant contamination identified. It is not expected significant impact over water quality. Seabed characterization with a multi-beam echo sounder. This information involves a high resolution Digital Elevation Model (DEM) and topographic products derived, such as slopes’ map, shady digital elevation model, rugosity, topographic index, etc. Characterization based on the catalog of Basque Landscapes. Some significant landscape places near bimep. It is expected slight effects during installation and moderate effects during operation. Benthic communities characterization (soft and hard bottom). Benthic communities sampling with grab in soft sediments and analysis with AZTI Marine Biotic Index. For hard bottom communities, sampling was done in several intertidal sampling stations. Benthic community in slight disequilibrium due to the high hydrodynamics of the area. Alteration to benthic communities are expected due to: (i) direct destruction; (ii) alteration in the proportion of hard-soft substratum, (iii) dragging action of anchors and ends; etc. No specific data available. Thus, an extensive bibliographic and web source information search was done. No specific data available. Moorings, fixed prototypes to the bottom, dikes, docks and similar devices may cause noise and vibration, which generally scares away fish communities. During operation wave devices may cause noise and vibration, which generally scares away fish communities but generally speaking, any artifact located in the sea may cause an attraction effect on fish communities, especially if it is floating. Some data coming from sightings of AZTI-Tecnalia personnel in different sampling campaigns. Bimep not sited in areas designated of international or national level of importance for seabirds. No significant impact on offshore birds is predicted during brief construction activities. Similarly, no significant impact was predicted during operation because of the relatively small-scale of the development in the context of the surrounding open sea area. No significant impact on offshore birds is predicted during brief construction activities. Similarly, no significant impact was predicted during operation because of the relatively small-scale of the development in the context of the surrounding open sea area. Commercial fisheries study (based on fish landing statistics, fisheries surveillance data, academic studies, previous fisheries reports) and consultation with local fishermen. Short-term interference with fishing activity will be mitigated through navigation measures, Notices to Mariners, liaison with local fishermen and other measures. Potential interference of fishing gear (e.g. snagging) by the sub-sea cable. Exclusion of fishing activity from the deployment area and safety zones around the WECs, potentially displacing established fishing grounds and adding pressure to neighboring fishing areas. Prevention of fishing expected, however, to benefit fish resources within the area in which fishing is excluded and this has the potential to benefit fish resources outside the safety zones. Consult on the Sub-aquatic Archaeological Catalog of the Basque Government. A sunken vessel was identified near the bimep area. Two Nortek profilers were installed, one in the shadow area of BIMEP, and the other one in a place far beyond from BIMEP in order to act as control area. Additionally, ADCP transects along all the BIMEP area were undertaken. For this, a sonobuoy was moored at 40 m depth on the 6 of June 2012 in the bimep area. This sonobuoy was developed by the Laboratory of Bioacoustics Applications of the Polytechnic University of Cataluña. The sonobuouy is able to detect and classify automatically all the acoustic events above the ambient noise (presence of cetaceans and noise) and store the information. It was moored on the 6 of June 2012 and during 5 months the presence of marine mammals and underwater ambient noise was monitored. The characterisation process of marine landscape was carried out in 4 stages: (i) defining each Landscape unit’s area; (ii) defining each landscape unit’s characteristics; (iii) defining activities, visibility and views and; (iv) presentation of landscape characterisation and base visual analysis. A) Visual census: (i) Line transects: five 200 m (surveyed 2.5 m each sided of the transect line) transect lines were placed along the tip of a “Isla de las lubinas” submarine mountain; (ii) Stationary methods: four sampling points at a 15 m depth were selected for visual inspection, one in the center of each of the four mooring areas of BIMEP. B) Active acoustic methods: five M3i buoys, developed by Marine Instruments (www.marineinstruments.es), were placed on the 6 of June 2012 in the area, one in each of the four mooring areas and one far enough from BIMEP area to act as control site. The M3i buoys are equipped with a GPS and echo-sounder (50 kHz and 500 W) and solar electric panels as their energy source. While the GPS of the buoy allows tracking the position of the buoy itself, the echo-sounder allows measuring the relative biomass below the buoy. The characterization of benthic communities was done by means of: (i) in situ sampling with a Shipeck grab sampler soft bottom sediments in five locations (4 samples inside the BIMEP area and one far beyond in order to act as control area) and by divers in five locations near the landing point of the submarine cable (Figure 2) and (ii) visual inspection with a submarine camera in 36 points distributed all along the submarine cable route and the mooring areas. Environmental Impact Studies and Monitoring Program reports (in Spanish) available through request to Basque Energy Agency (EVE, Ente Vasco de la Energía). Complementary explanation of the methodology can be consulted in the following paper: Protocol to develop an environmental impact study of wave energy converters. The Environmental Impact Study of the Biscay Marine Energy Platform (BiMEP) project. Poster presented in the II Bilbao Marine Energy Week. Bilbao 20-24 April 2015. Environmental Monitoring Plan of the pre-operational phase of the Biscay Marine Energy Platform (BiMEP) project. Poster presented in the II Bilbao Marine Energy Week. Bilbao 20-24 April 2015. Impact on seabirds of new offshore wind energy test and demonstration projects in the Biscay Marine Energy Platform (BiMEP, N. Spain). The environmental monitoring plan previous to the installation and construction of BIMEP (pre-operational phase) were undertaken in 2011. In 2013, the environmental monitoring plan of the construction phase of BIMEP was undertaken. This monitoring phase correspond to the environmental monitoring of submarine cable installation in BIMEP which begun on the 20th September 2013. Two sampling campaigns where undertaken: (i) the first one was done prior to the installation of the cables. The objective of this campaign was the establishment of the baseline noise levels in bimep; (ii) the second one was done during the installation of one of the submarine cables. The sampling campaign was done with an icListen HF 200 kHz hydrophone of Ocean Sonics (http://oceansonics.com/). In each campaign 5 minutes measurements at 10 m depth where done in 15 sampling points all along the cable route. With all the information gathered, a sound propagation model will be developed in order to modelize the sound propagation of the installation of the submarine cables and then to evaluate the extent and impact of these operations. Active acoustic methods: five M3i buoys, developed by Marine Instruments (www.marineinstruments.es), were placed on the 6 of June 2012 in the area, one in each of the four mooring areas and one far enough from BIMEP area to act as control site. The M3i buoys are equipped with a GPS and echo-sounder (50 kHz and 500 W) and solar electric panels as their energy source. While the GPS of the buoy allows tracking the position of the buoy itself, the echo-sounder allows measuring the relative biomass below the buoy. Environmental impacts over fish communities of submarine cable installation in the Biscay Marine Energy Platform (BiMEP).